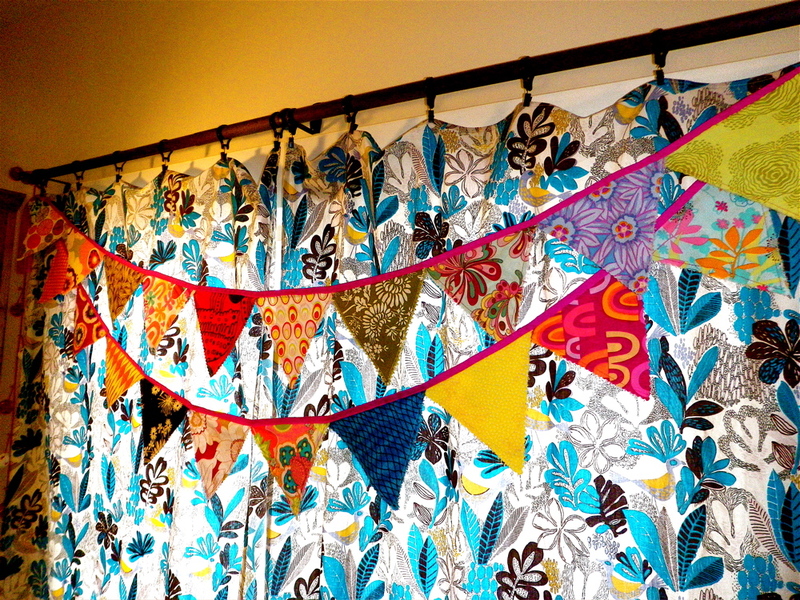 Make a decorative banner from your own eclectic mix of fabrics. Liven up any room or occasion. 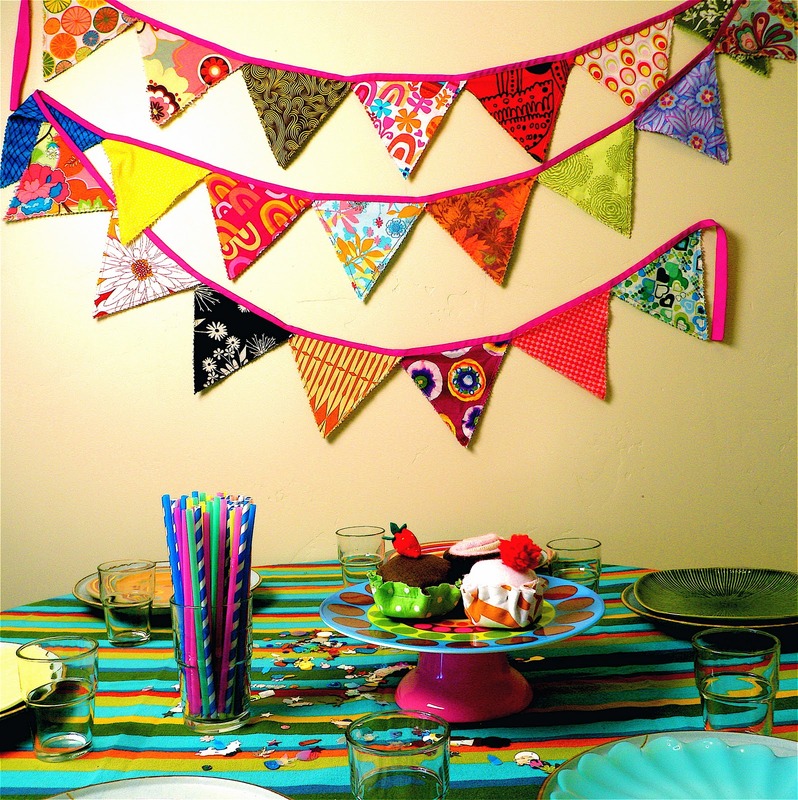 Customize your banner for a nursery, theme party or color scheme. Here is what you need to know, and the 12 easy steps to make it happen. Tools you will need: a cutting mat, rotary cutters- one with a straight blade and the other with a wavy blade, scissors, ruler, seam ripper, cardboard pattern for the flags that make up the banner, an iron, and a sewing machine. You can decide what size to make your flags, the pattern pictured here is an equilateral triangle with all sides 8 inches long. 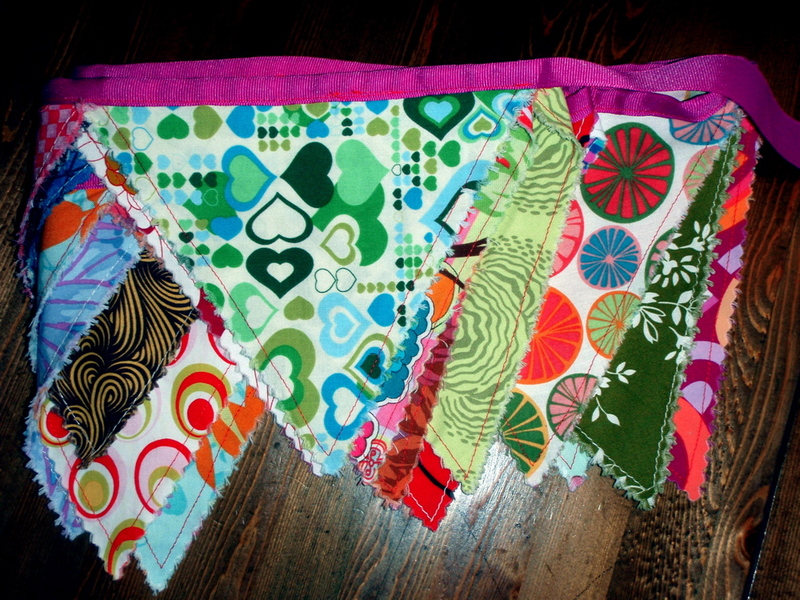 Step 1: Begin by picking out 20 or so different fabrics (to use for the flags), into triangles. 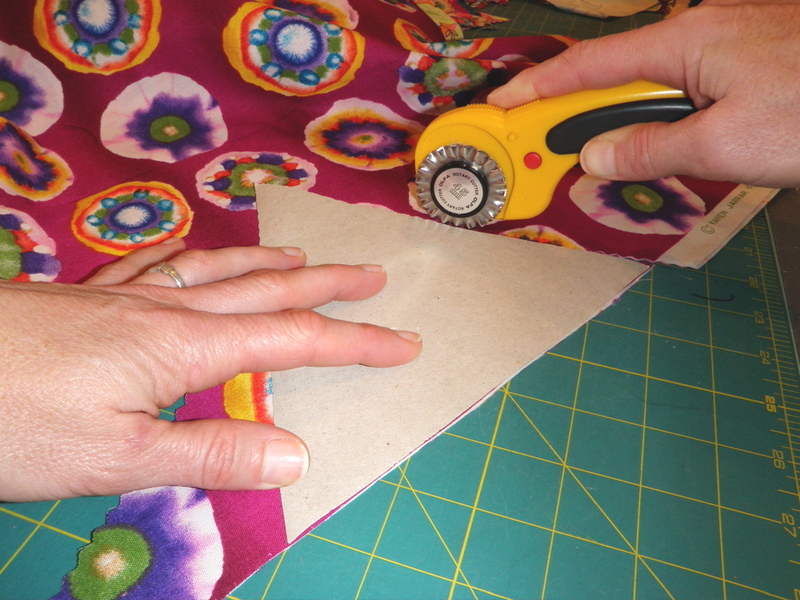 Using the wavy rotary cutter (and the ruler if you’re feeling wobbly) cut two sides of the triangle. 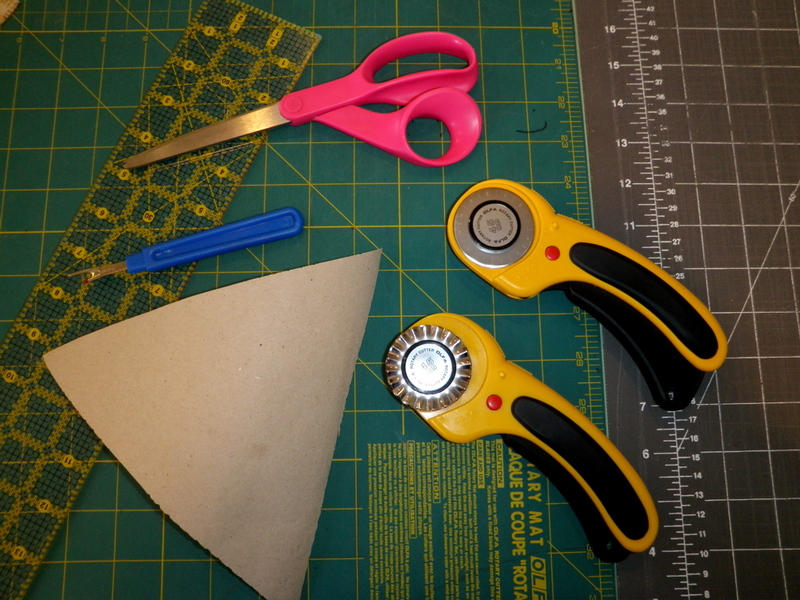 Use the straight rotary blade to cut what will be the top of the triangle. Cut two piece of fabric for each flag, one for the front and the other for the backside. Pick a few stripes, some small repetitive patterns, and a few larger prints. Think color and pattern when choosing your fabrics. 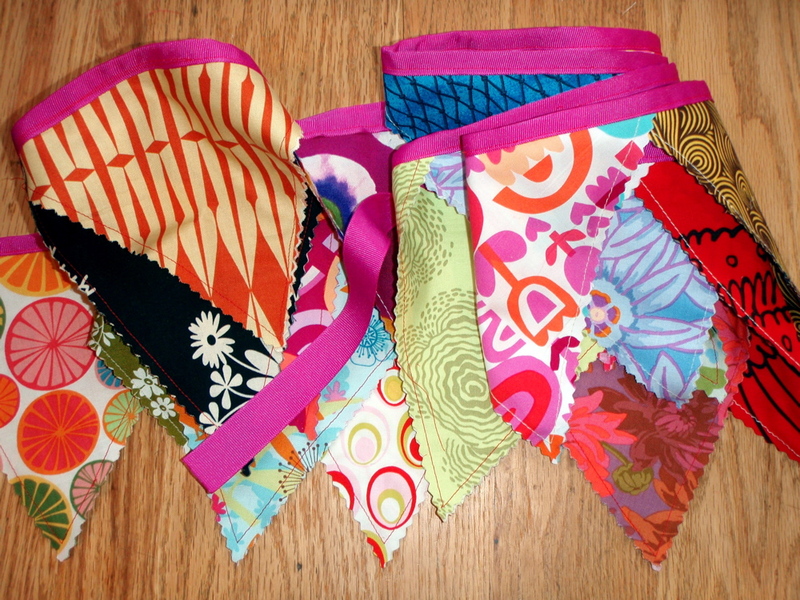 **This is a smart way to use up fabrics from your scrap bin. Step 2: Set aside the triangles of fabric. 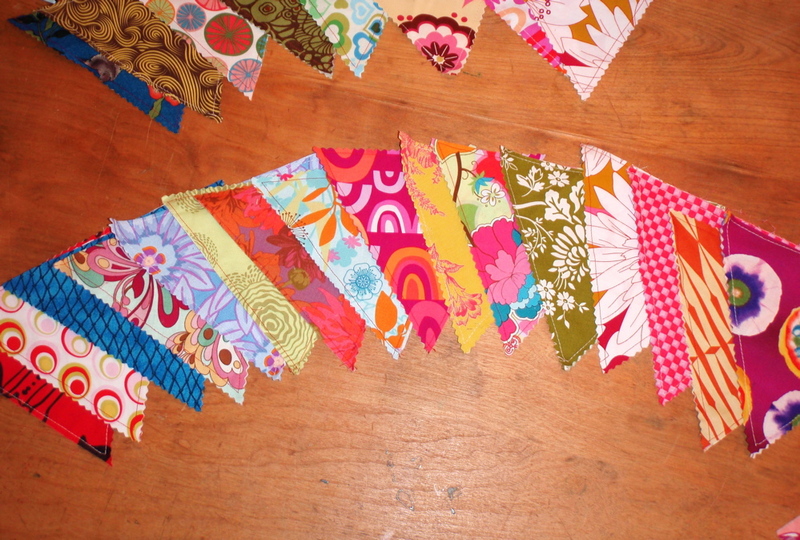 **The fun part of making a banner is in choosing the fabrics. 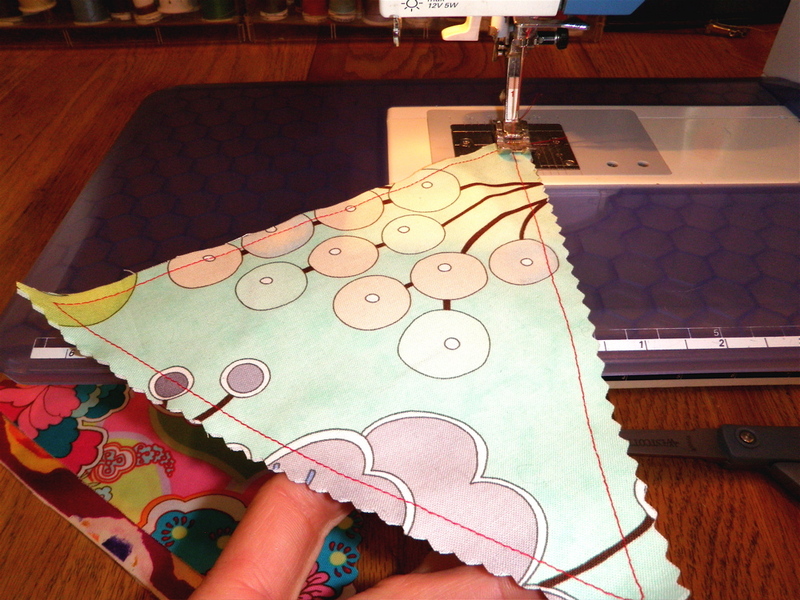 It is easy to include fabric that you might have in your sewing stash that you don’t particularly love; but in small pieces, really add color and flavor to the overall project. 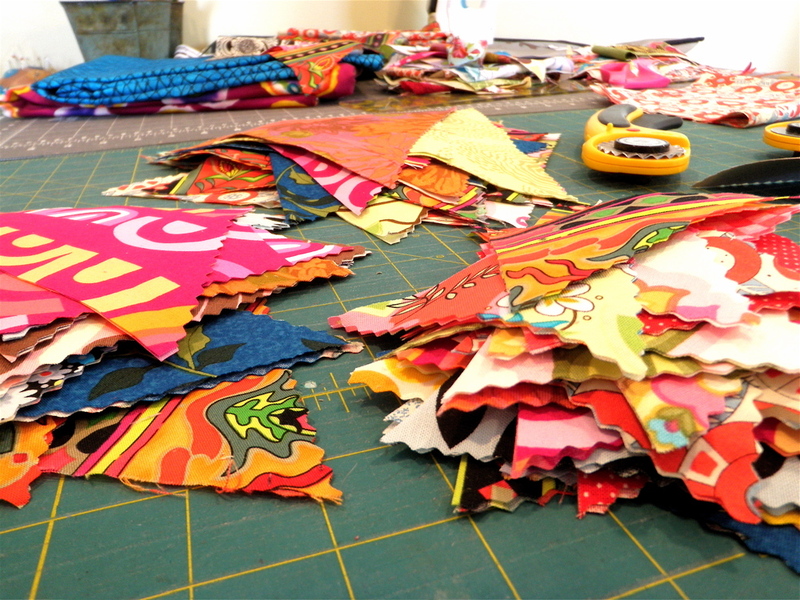 You might even get carried away- and the next thing you know- you have stacks of triangles piled up everywhere. 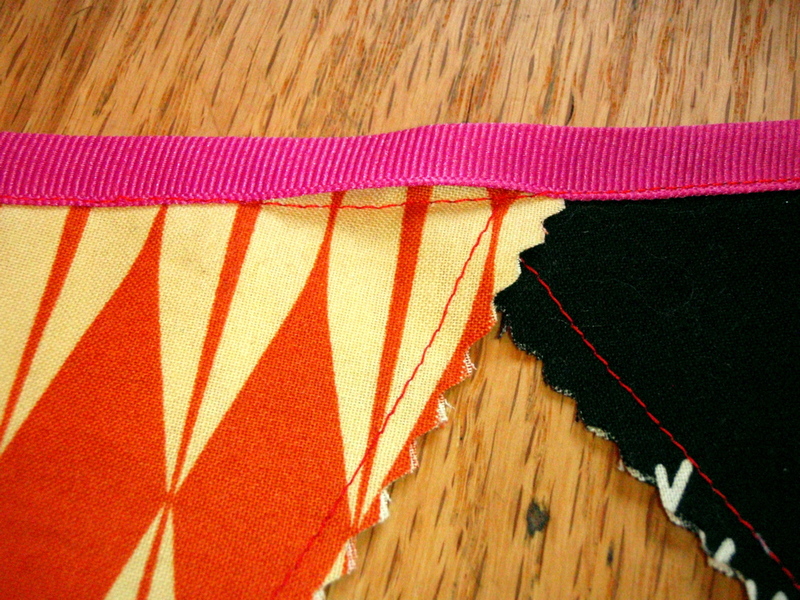 Step 3: With the wrong sides of the fabrics together (right sides out), sew both sides together with a straight stitch along all three sides of each triangle, with preferred thread color. Step 4: Line up your flags in the order you prefer, keep a few extras on standby. You might need more flags to achieve a desired length. When you are finished deciding the order, stack the flags and set them aside. Step 5: Now it’s time to choose what you will use to string all of the flags together. 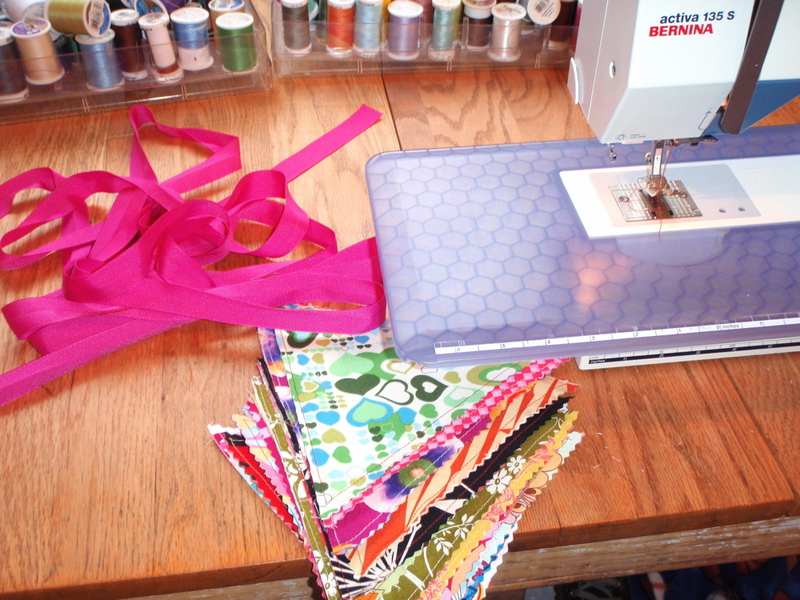 A few options include ribbon (more expensive), or bias tape (considerably cheaper per yard or foot). Or let the creative juices flow… large rick-rack, lace, an old dog leash… you get the picture). I like grosgrain ribbon, I’ve used 7/8 inch wide ribbon on this banner. Choose a desired length for your banner and add 12 inches on either end (for versatile hang-ability). For a generic party banner (for use on many occasions), I would recommend making the banner at least 12 ft. long. **If you use bias tape make sure to purchase the double-fold kind like the turquoise one shown above, both unfinished sides are pre-pressed into the middle making your life a bit easier. 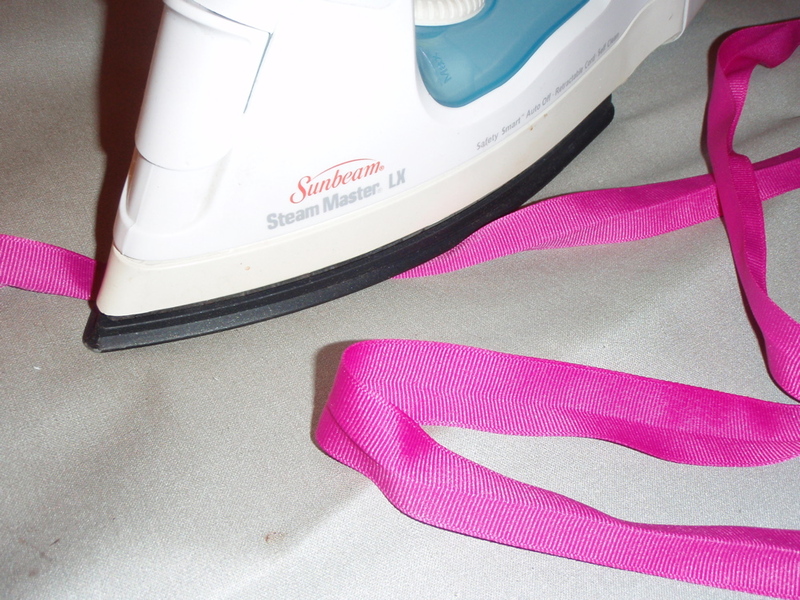 Step 6: Press the ribbon or bias tape in half lengthwise with an hot iron. 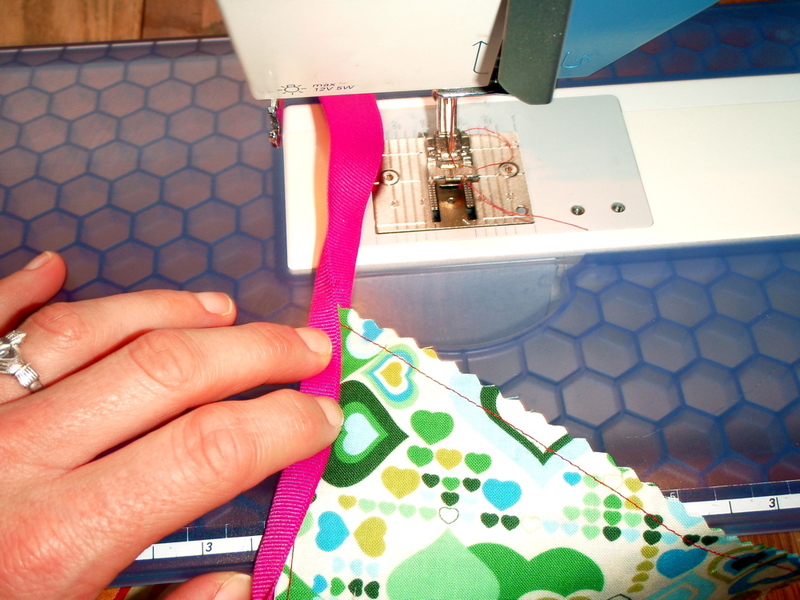 This isn’t essential, but makes sewing the flags to the ribbon/bias tape a lot easier. 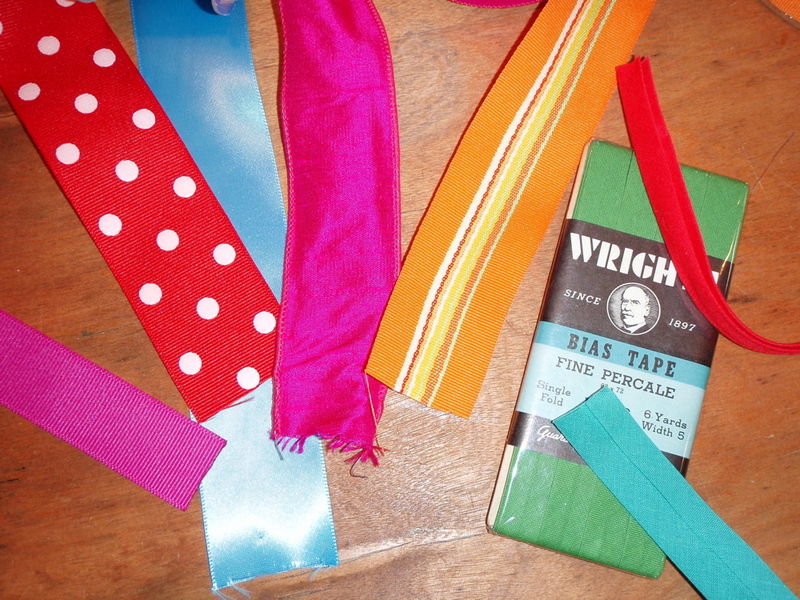 Step 7: Get your flags and ribbon ready to sew together. Flags should be organized in the order you wish them to appear in the finished product. Step 8: Measure out 12 inches from the end of the ribbon. Then using your ironed crease, find the middle of the folded over ribbon and begin by placing the straight-cut side of the first flag into the ribbon crease and sew with a straight stitch close to the edge of the ribbon, and through all layers. Step 9: Continue using a straight stitch, sewing the flags to the ribbon. Stitch close to the edge, overlapping the flags about an inch. 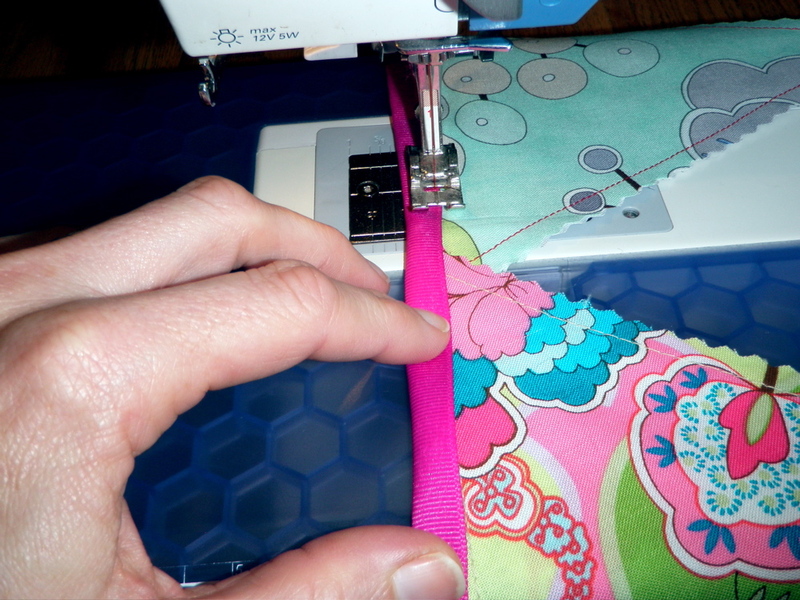 Step 10: It may be useful to use a seam ripper ( an indispensable tool for so many applications of sewing and otherwise, I always have one close at hand) to ease the ribbon through the machine and avoid ripples or creases in the finish product. Step 11: When you have finished sewing the entire length, carefully leaving 12 inches of extra ribbon at either end, turn the banner over. No matter how careful you are, there will be places on the underside of the folded ribbon where your stitching missed the ribbon, like the above picture. 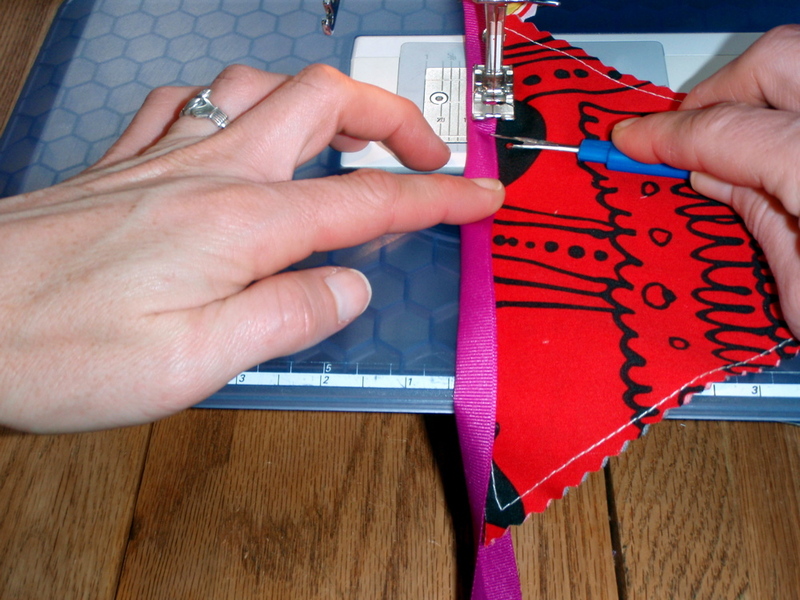 No worries, simply sew back over the missed places, or sew another straight stitch the entire length of the banner, just 1/8 inch or so away from your first pass. Step 12: Now take your completed banner and toss it in the washer with a load of laundry, extra long cycle. When the load of laundry is finished, remove the wet, frayed banner and lay it out flat to dry or tumble dry on low heat. After the banner has been washed, the wavy cut edges will be slightly, cleverly weathered. Press with a hot iron or smooth flat with just your hands. You are finished, your banner ready to display.